Russell Keune, an only child born to Catherine and Richard Keune of Chicago in 1938, left a lasting impact on Vesterheim Norwegian-American Museum, after a life’s path that led him across both the United States and the international community. One may wonder how Russell, born of Dutch and German parents, came to have such a positive influence on a Norwegian-American museum—look no further than his wife, Ingrid Christina (Tina) Keune. She worked for him as the Park Service summer intern at the Historic American Buildings Survey (HABS), and after they married, he ended up working for her. the public new avenues of learning about and appreciating America’s heritage. He pursued a Master’s degree in architecture at the University of Illinois in 1963 that included self-directed study related to the history of American architecture and its preservation. A six-week seminar in Williamsburg, Virginia, for historical agency administrators, followed by a six-month Plymm Fellowship in Architecture from the University of Illinois, were professionally transforming experiences. Throughout the second half of the 1960s, Russell worked for the National Park Service and was involved with implementing Title II of the 1966 National Historic Preservation Act, which also included the National Register of Historic Places. He became a licensed Virginia architect. He and Tina were married and they had a son, Eric. with the International Committee of Monuments and Sites, Russell continued the work he had fostered with the National Trust for Historic Preservation. As Senior Vice President for Preservation Programs he helped expand the role of preservation awareness on an international scale. Russell was the son-in-law of a Norwegian/Swedish family, and their traditions became his traditions, which in turn ushered him into the realm of Vesterheim. Participating in Vesterheim rosemaling classes and folk art tours over several decades provided Tina with unique learning opportunities. She and her mother, Elsa Friberg, joined the museum as Life Members of Vesterheim in the 1980s. Russell’s retirement offered him the opportunity to volunteer with different organizations. In 2000, he joined the Vesterheim board and served as its Chair from 2004 to 2006. His years there saw expansion in programming, collections, and educational opportunities. He took the lead working with the board to write The Year 2050: Future Visions for Vesterheim Norwegian-American Museum. 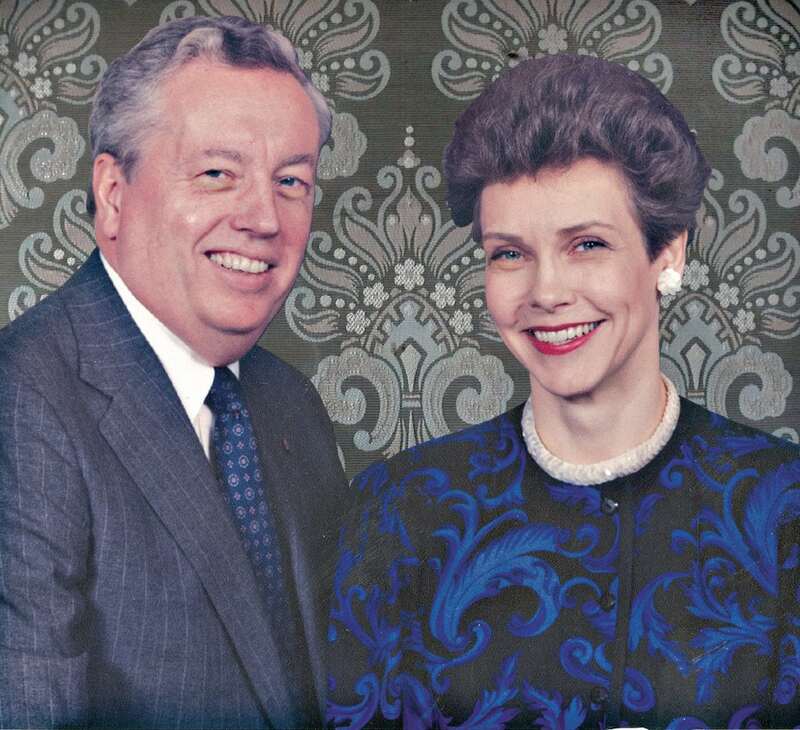 Russell and Tina elected to leave a lasting legacy by joining the Valhalla Society, Vesterheim’s planned giving program. In addition to being Valhalla Society members, the Keunes are Compass Club members, an automatic monthly giving program providing consistent financial support to Vesterheim. The importance of the Valhalla cannot be overstated. Over the last 10 years, Vesterheim has welcomed many gifts from supporters that will have an effect far beyond their lives. Russell passed away in 2015, but Tina continues to sustain Vesterheim and carries on the strong legacy of the Keune family. From all of us at Vesterheim, we thank the Keunes for their invaluable support over the years!